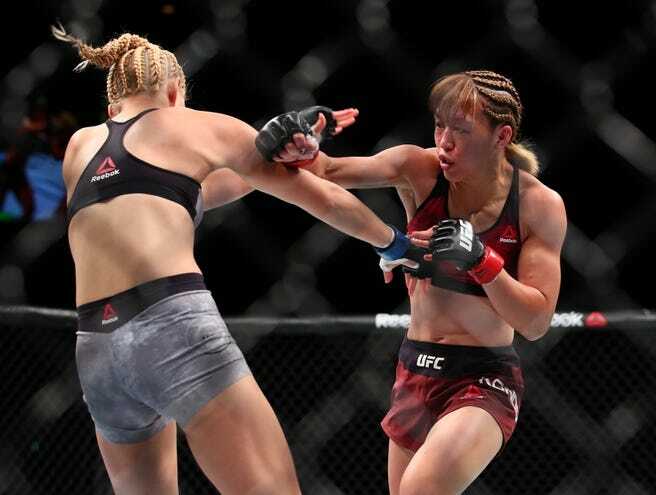 Filipino-Japanese joshi and mixed martial artist Syuri Kondo made her UFC debut this morning with a split decision win over Chan-Mi Jeon at UFC Fight Night 117 in the Saitama Arena. You'll remember Syuri as the headliner for Joshi+Jam Manila, the wrestling show Japanese promotion REINA staged here for the benefit of Typhoon Yolanda victims. Syuri's win in the strawweight bout, the sixth in her career, extended her undefeated record of 6-0 with all but one going the distance. This also contributed to a sweep of the preliminary matches by the Japanese fighters. Syuri made her MMA debut in Pancrase on April 2016, but still takes pro wrestling bookings as a freelancer here and there. In the same card, the lone Filipino fighter, Rolando Gabriel Dy, lost by unanimous decision to Teruto Ishihara. A left straight from Ishihara punished a roundhouse kick attempt by Dy and gave the local fighter a 10-8 score for the first round. Dy would make his comeback, but three shots to the groin throughout the match (with the last one making Ric Flair proud) cost him a one-point deduction and the fight. Photo by Susumu Nagao for USA TODAY. Check out Mike Miguel of Dojo Drifter's interview with the "Queen of Pancrase" here.